Yellowstone National Park and its gateway communities and surrounding mountains provide a plethora of horseback riding choices. There are plenty of outfitters and guides available but if you are going solo carry pepper spray for bears and know where you are going. Somehow the sage-covered valleys and breathtaking canyons seem even more impressive on horseback. 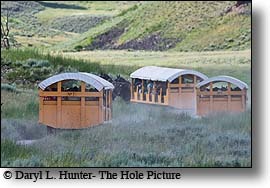 This ride goes through an open meadow adjacent to the Grand Canyon of the Yellowstone (not visible from the trail). 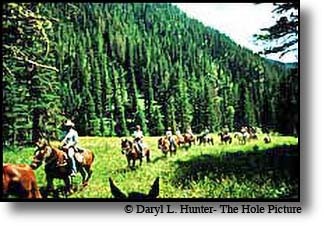 The ride follows Cascade Creek through a wooded area and returns to the corral through a series of meadows and pine forests. This ride goes through sagebrush flats along Garnet Hill. 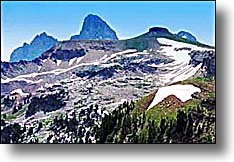 It then goes up a hill and across a stream from a view of Pleasant Valley and Hellroaring Mountain. It loops around and heads back to the corral through the other side of the Valley. This ride heads up a wooded hillside behind the corral. At the top of the hill, the ride goes through sagebrush flats and meadows. 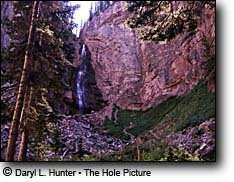 It then reenters a wooded area and travels along Lost Canyon and over Lost Creek. 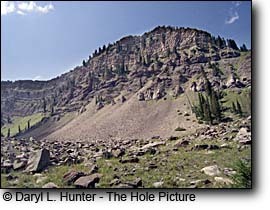 It then climbs up to and around Lost Lake, coming out by the Petrified Tree. The ride goes through Pleasant Valley on the way back to the corral. Horseback rides are also available to the Old West Dinner Cookout. 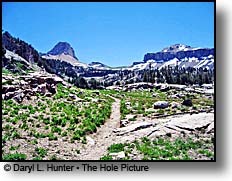 This ride takes you on an easy trail through sagebrush flats toward Bunsen Peak. Near the base of the mountain the trail drops down and loops around through a large aspen meadow, eventually returning to the corral. Join us for Horseback Riding in Yellowstone National Park, including pack trips, day rides and fly fishing. 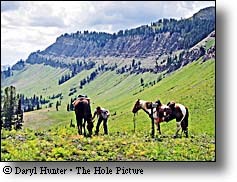 We are outfitters offering backcountry horse pack trips in Montana and Wyoming. 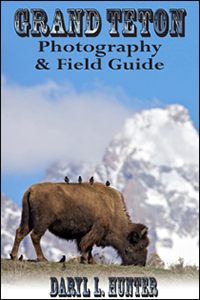 Guides include Yellowstone composer Jett Hitt and a former ranger. 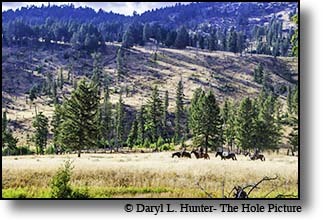 What is a trip to the Greater Yellowstone Region without a trip into the surrounding mountains on the back of a horse? A trip to the region is such a flashback in time, it’s only appropriate to take a step back in time and hang on for the ride. 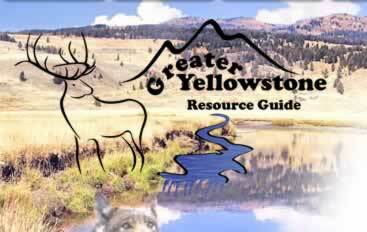 Yellowstone’s prehistoric essence with its free flowing rivers, geysers, fumaroles, hotpots and giant herds of Bison moseying down the plain and the Teton regions beautiful ranches and cowboy towns set the stage for a yearning for a trip into yesteryear on a horseback ride into the storied scenery of our west. 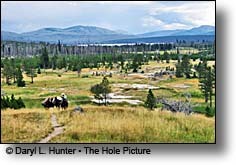 It is very easy for you to experience your own western adventure on a Yellowstone Region horseback riding adventure. Thousands of miles of national forest and parkland remain undisturbed and free from development. Nature hikes, horseback rides, wildlife viewing and wide, open spaces await to rejuvenate your soul. 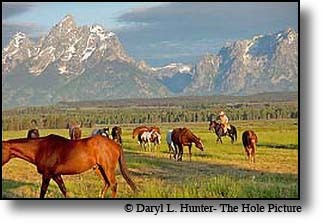 Most horseback riding outfitters have friendly horses that can actually tear your attention away from the scenery, no small task in the mountains of the Yellowstone Teton Region. 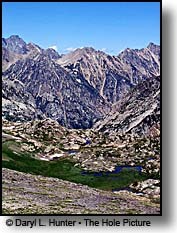 Ethereal mountain landscape where jagged peaks tower more than a mile above aspen and conifer covered foothills valleys. With scattered white pine, grassy meadows and interspersed with areas of sagebrush plain. Horseback ride through sage-covered hills beneath the shadow of our monolithic granite spires. 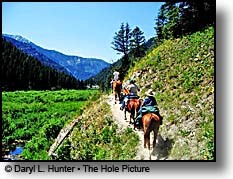 Take a trail ride up a mountain canyon to where the view breaks out of a valley a mile below you. Help herd the cows of a working cattle ranch. Some horseback trail ride outfitters provide meals out on the trail or feed you when you get off the trail. 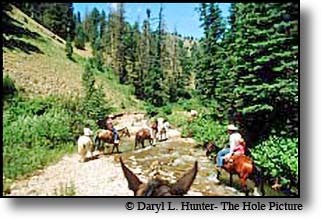 The fisherman can find horseback riding outfitters that can take you back to that remote mountain stream so far off the beaten path that the fish are actually glad to see you. By the end of your horseback riding trip you’ll be able to identify with the line from City Slickers: Yesterday they were businessmen, today they're cowboys, tomorrow they'll be walking funny. 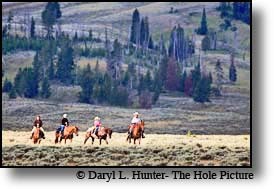 Whatever level of rider you are; there is a horseback trail ride outfitter of the Yellowstone region that can fulfill your dream. 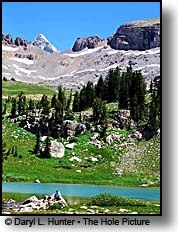 Swan Valley Outfitters • (Swan Valley Idaho) Swan Valley Outfitters is a family owned and operated business. 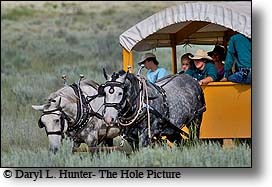 We offer the best scenic trail rides and hunting in the are . Come and enjoy the experiences of a lifetime. Swan Valley Outfitters will take you on a scenic Trail ride that offers you the rare opportunity to experience beautiful mountain views and abundant wildlife. Escape hectic day to day life to enjoy a remote, relaxing, serene day. 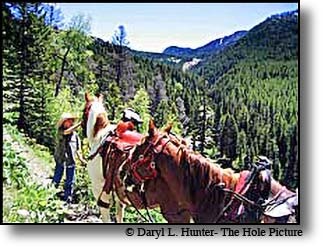 the Most experienced guides in the area will place you on a "gentle" mountain horse, with no worries about your mount, you will be free to take tons of fabulous photographs. You will definitely not want forget you camera on this outing. Midday through your trip you will enjoy a authentic cowboy meal. We offer many different hunts from mountain lion to trophy elk. Our experienced team of guides and mounts will take you on the experience of a lifetime. 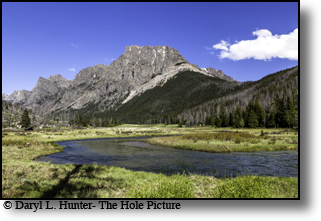 Hidden Basin Outfitters • (Jackson Hole) Hidden Basin Outfitters offers horseback trail rides and camping trips in some of the most remote and scenic terrain of the Teton Mountain Range. Our rides will take you through backcountry forest and spectacular mountain landscapes. 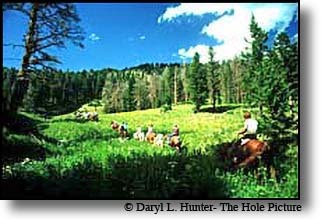 You can ride, hike and relax to your heart's content surrounded by the vast beauty of the wilderness, where wildflower meadows and wildlife abound. 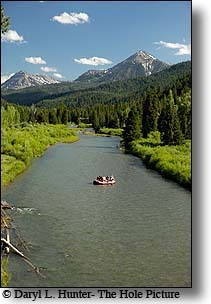 Riders may also try their luck fly fishing in the stream near our camp. Our trips range from single-day rides to overnight trips and week-long vacation adventures. 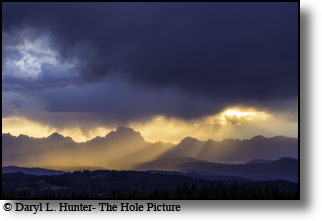 Yellowstone Horses Outfitters •( Island Park)Yellowstone Horses Outfitters offers daily horseback riding excursions that originate at the Eagle Ridge Ranch located near Island Park, Idaho and West Yellowstone, Montana. 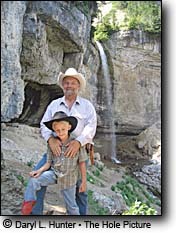 The privately owned guest ranch of more than 2,000 acres boasts numerous lakes and streams, a vast assortment of wildlife, and thousands of grazing cattle. 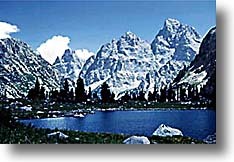 The horseback rides also travel through Targhee National Forest near the Continental Divide. The scenic views in every direction at the ranch are spectacular! 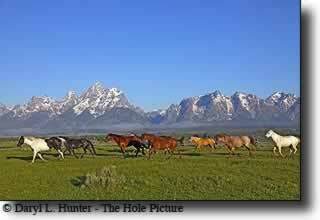 To top it all off, the horses at Yellowstone Horses are unsurpassed by any other dude ranch in the area! Come take a ride with us – it will be an experience you won't forget! 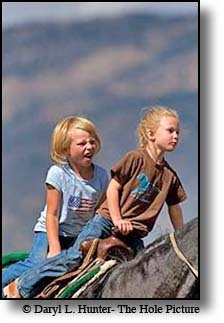 Mill Iron Ranch  (Jackson Hole) Mill Iron Ranch has been a Wheeldon family tradition for three generations now. We carry on the old cowboy traditions around here. showing Jackson visitors how to ride, fish, hunt and camp. Granite Creek Guest Ranch • (Swan Valley) Our guest ranch offers one of the most flexible guest activity schedules in the West all in the heart of spectacular Idaho mountain river country near Jackson, Wyoming, and Yellowstone National Park. Cattle drives and Roundups (1-4 hours duration). 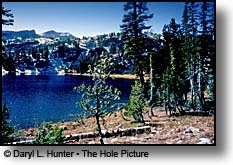 Scenic Trailrides, Boating, canoeing, and fishing on a 5 acre lake. 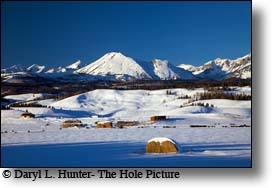 Absaroka Mountain Lodge • (Cody WY) At Absaroka Mountain Lodge, horseback riding is our main activity! 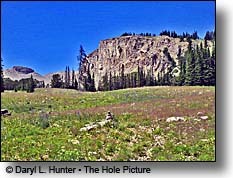 The trails on the Northfork of the Shoshone National Forest offer a variety of beautiful terrain. Sparkling river crossings, towering pines and breathtaking high mountain views all await your arrival. Choose a leisurely two-hour ride, or join us for an experience that will be a feast for your eyes as well as your stomach. 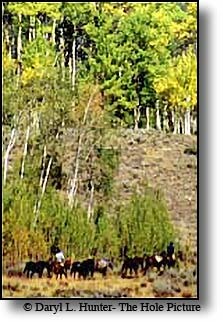 Jakes Horses • (Big Sky MT) If riding's your pleasure, we have a wide variety of trails and rides to suit the tenderest tenderfoot or the most experienced rider - from an hour to a week or more. We run trail rides all year long. If you come along on a winter ride, wear ski clothes, the warmest boots you have, and don't forget gloves and a hat. Please call for reservations and prices. 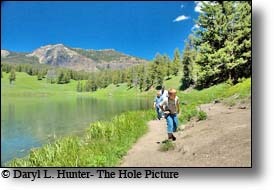 Forest service fee and 3% resort tax are additional. 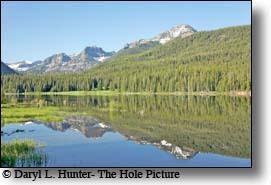 Boulder Lake Lodge • (Pinedale WY) Enter Forest Gate and follow gentle trail though aspen and pines along Boulder Creek, enter the Bridger Wilderness, cross Forest Service Bridge and continue along the rushing Boulder Creek, pass the Beaver Pond and the Stillwaters, where the rushing Boulder Creek becomes calm. Moose and other wildlife often spotted here. The trail then gains elevation to the spectacular rushing waterfall! 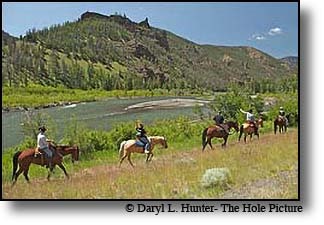 Bitterroot Ranch • (Dubois WY) Horseback riding is the main activity at our ranch where many of the horses have been raised and trained. A herd of about 135 horses under saddle for an average 25 clients makes it easy to provide suitable mounts in top condition throughout the season. Rides are kept small and guests are grouped according to skill. A family of differing experience can enjoy riding together at the speed of the least skilled or join another group more appropriate to their ability. On most days there are 2-3 hour morning and afternoon rides. All day picnic excursions on Saturdays enable you to explore the high country and most weeks there will be an opportunity to herd cattle.